Two weeks ago Allison laid out a pair of pink shorts and a white tank top with a striped bow for Madison to wear the next day. After her bath, Madison got dressed in her pajamas and crawled into bed where she clasped her hands together to say her prayers then adjusted herself among her army of stuffed animals and we tucked her in for the night. A night just like any other, except it wasn't. I felt like I was watching my little girl get ready for bed fully expecting her to be grown by sunrise. The next morning we woke her up, fed her breakfast, brushed her teeth and helped her one limb at a time into the preselected outfit for the day. 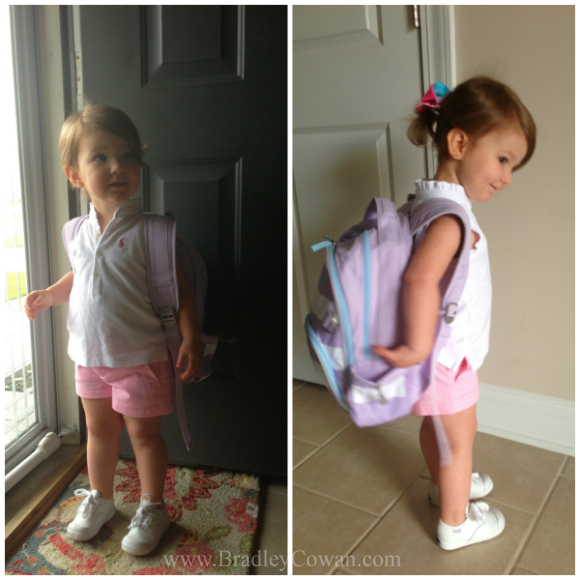 Several hugs, kisses and pictures later we dropped her off for her first day of preschool. 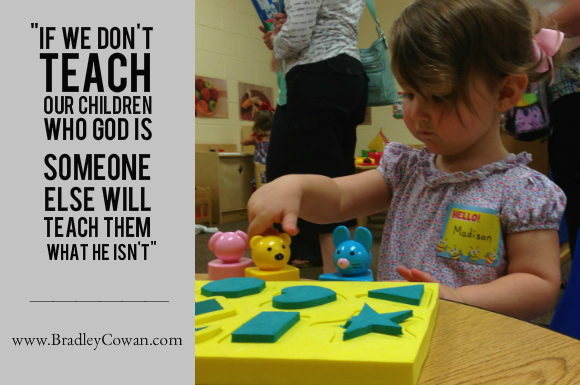 A task that seemed much more difficult as a parent than it did for a two year old. Back in March, Allison and I realized it was important for Madison to have some structured socialization with children her age. While she gets time to play with kids in and around her age group, rarely does she get to do so in a learning environment. During the week, my mother-in-law watches her while Allison and I are both at work so preschool would provide a break for her and a change of scenery for Madison. We researched preschools in our area and decided to take a tour of a local church that offered a preschool program for toddlers. We spoke with the Director and toured the building leaving with a sense of security and answers to our numerous questions; ultimately we decided this would be a good fit for all of us. A few days before school actually started, we attended orientation (or open house) to introduce Madison to her teachers allowing her the chance to familiarize herself with her surroundings before the first day. During that meeting, the parents were addressed separately while the children acclimated to each other, their teachers and their classrooms; one particular comment stuck with me that evening and spoke to every doubt I had. The first day came and went. We walked her to her classroom and I stepped aside to hang her backpack on the designated hook with her name above it while Allison knelt down for a hug and a kiss. I stepped back in the doorway and squatted for mine, but Madison had already ran inside with my goodbye lost somewhere in the tiny footsteps leading away from me. Just as quickly as my heart broke, the pieces found their way back together again... I was happy for her. This was a good decision. As a parent, the constant struggle of making the best choices can be overwhelming at times. 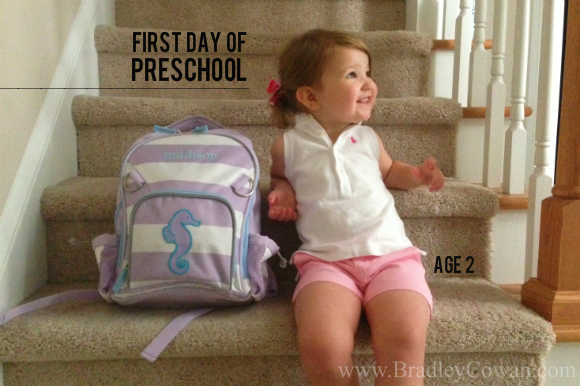 Preschool is only two days a week for a few hours each day and she loves it. I love that she loves it. However, I can't help feeling that school is a countdown where we've started the stopwatch completely overlooking the absence of a pause/stop button. Today I walked her down the hall to a classroom and before I know it I'll be walking her down the aisle. A day just like any other, except it won't be. Not at all. Not even close. Awww waking her down the aisle. Slow down :). Glad preschool is going great for her. It makes it easier for us parents when the kids like going to school. I know, I know. Walking her down the aisle is quite a jump from preschool, but I have trouble processing that she's two already!